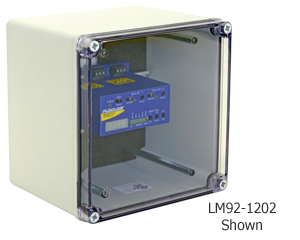 The general purpose AC powered level controller displays engineering units with one 4-20 mA level transmitter, two programmable relays and an isolated 4-20 mA repeater. Relay one is configurable on a single set point. Relay two can be configured on a single set point or latched on two set points for automatic fill or empty control in simplex mode. Select this DIN rail mount controller for use with general purpose two or three-wire level transmitters. 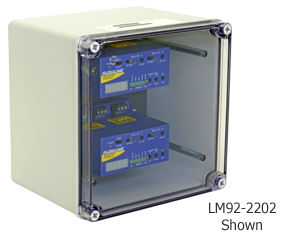 For field mount installation, add a single or double NEMA box.